When I began to learn of and appreciate the work of André Parrot, Curator-in-Chief of the French National Museums, Professor at the School of the Louvre, and Director of the Mari Archaeological Expedition, I purchased most of those masterful little books he wrote about Biblical cities. In connection with the recent post about Nineveh I took down my well-marked copy of Nineveh and the Old Testament (1955) and began to read again. André Parrot writes of his April 1950 arrival at Mosul. During the twenty years spent in Iraq or in Syria, we had never had an opportunity to cross the ‘Assyrian triangle’ Once again we realized how necessary it is to see in order to understand, and especially to hold in the memory. Knowledge gained from books is certainly not enough, for names which are not attached to any reality are nothing more than ghosts. Ghosts of cities, shadows of men, vague floating shapes, without solidity, though one tries to capture it with the aid of a drawing, a photograph or a vivid description. All students of archaeology know this by experience: nothing can replace actual contact with the object. That is why museums are so important; because there one can recognize the long chain of human history stretching out continuously from its beginning, but in which, instinctively we have a special interest in detecting and observing the first links. But the object is a prisoner in its glass case. Tom from its natural surroundings it has lost its true speech. Nevertheless it exerts a pull, it beckons one to take the road. 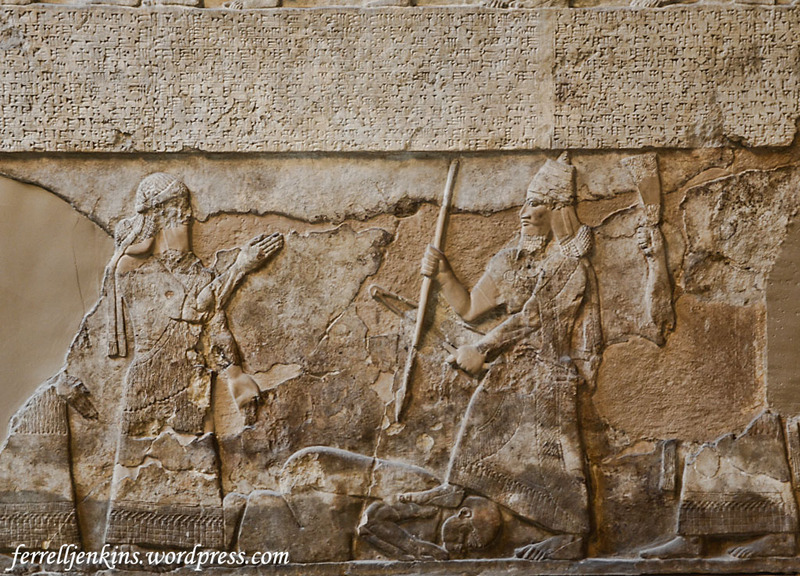 It is impossible to contemplate the Assyrian reliefs in the Louvre or the British Museum without calling up the image of Nineveh. Parrot points out that a visit to Nineveh can be disappointing “if one expects to see murals or palaces.” These things, he says, have been destroyed or crumbled away. is bound up with that of Mosul and the white cell in the monastery where, every evening of that short stay, we were able to meditate only a few yards from the Assyrian capital, on the vanity of empires and the fate which awaits all of them. For the same reasons I have spent many years encouraging Bible students to visit the Bible lands. 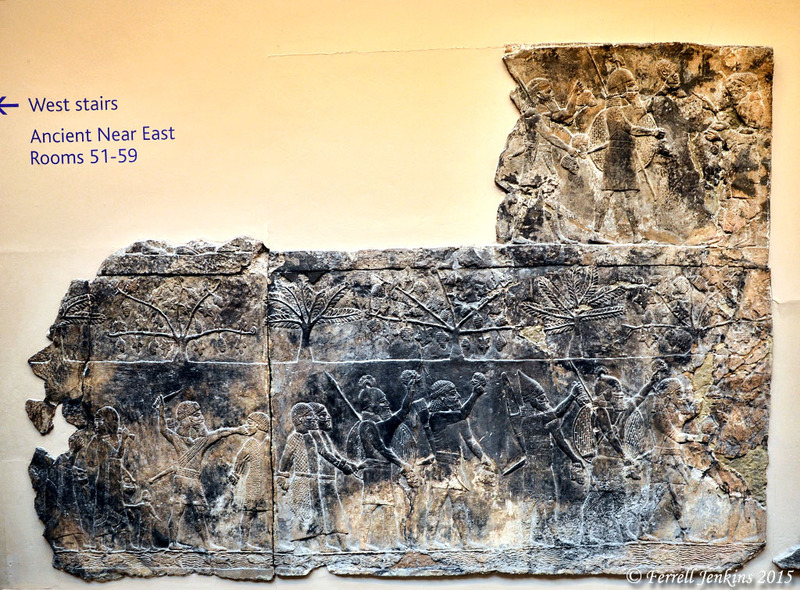 The British Museum displays many reliefs from Nineveh. Information posted with the relief below says that it dates to about 700-692 BC. It comes from the SW Palace, Rm. 14, panels 13-15. 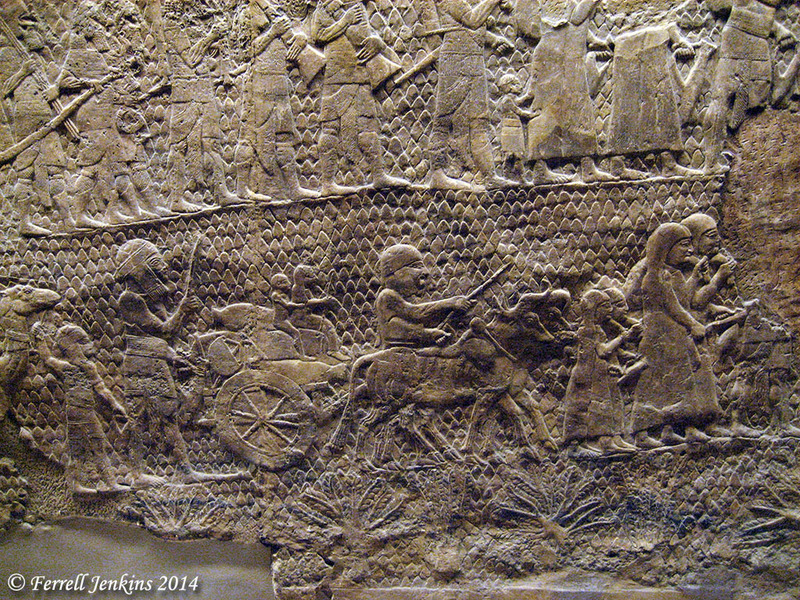 After the capture of Alammu, a town of uncertain location, the prisoners are brough before the Assyrian king. Some carry heads of the dead. The king, Sennacherib, was shown in his chariot, but this part is now lost (WA 124786-7). Click on the photo for a larger image. 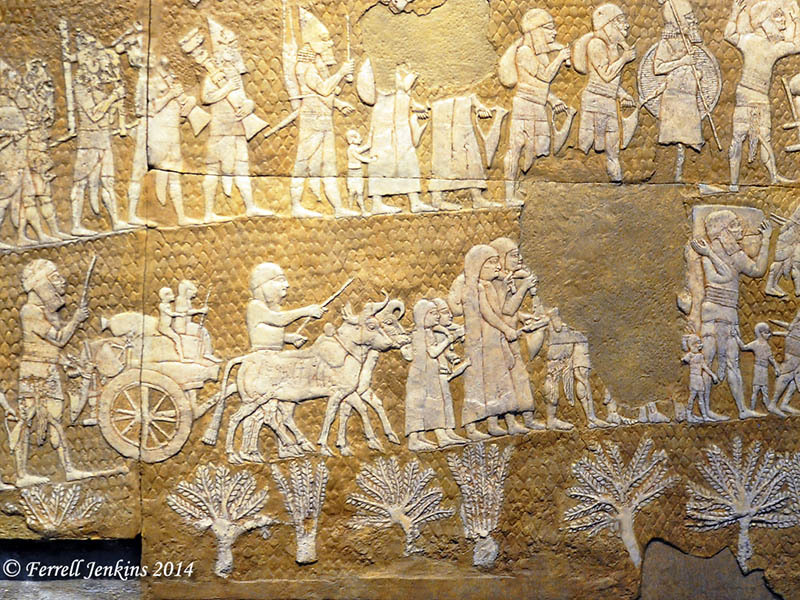 This Assyrian relief from Nineveh shows Prisoners from the town of Alammu. British Museum. Photo by Ferrell Jenkins. 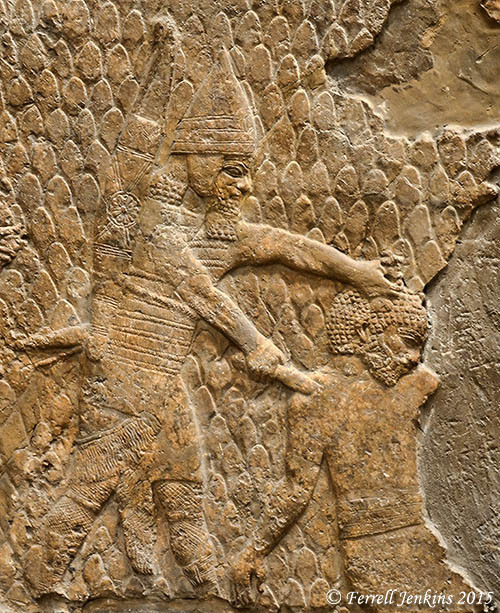 Post-traumatic stress as early as 1300 B.C. A team of scholars at Anglia Ruskin University in the East of England released a report showing evidence of post-traumatic stress as early as 1300 B.C. The study involved documents from ancient Mesopotamia. The brief notice is available at BBC here. I found it interesting that the photo associated with the article shows an Assyrian king of the 9th century B.C. with a bow and arrow, and two others with javelins. In fact, this is not a war or battle relief. A view of the entire relief shows that it was the king is on a lion hunt. But, that has nothing to do with the validity of the report. 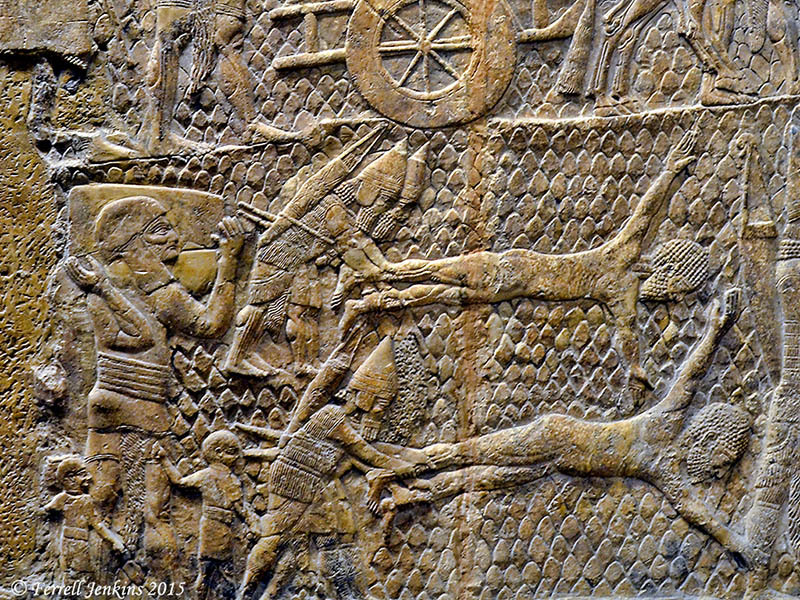 Several examples of the cruelty of war in ancient times is the limestone relief of the siege of Lachish which was found in Sennacherib’s (704-681 B.C.) palace at Nineveh. A replica of the relief may be seen in the Israel Museum, but the original is in its own designated room in the British Museum. 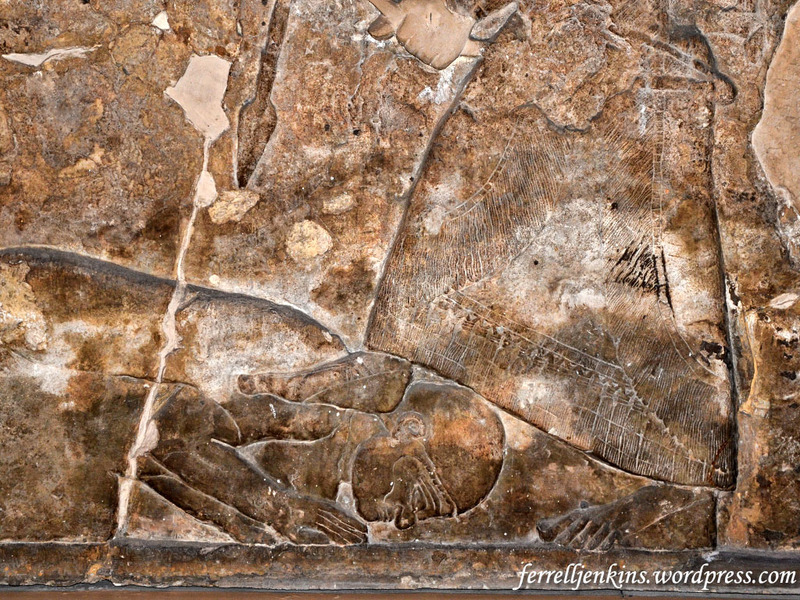 An Assyrian warrior kills one of the locals at Lachish. Photo by Ferrell Jenkins. The Bible mentions the siege of Lachish in several places, including 2 Chronicles 32:9-10. Counting the heads of the dead at Lachish. Photo by Ferrell Jenkins. 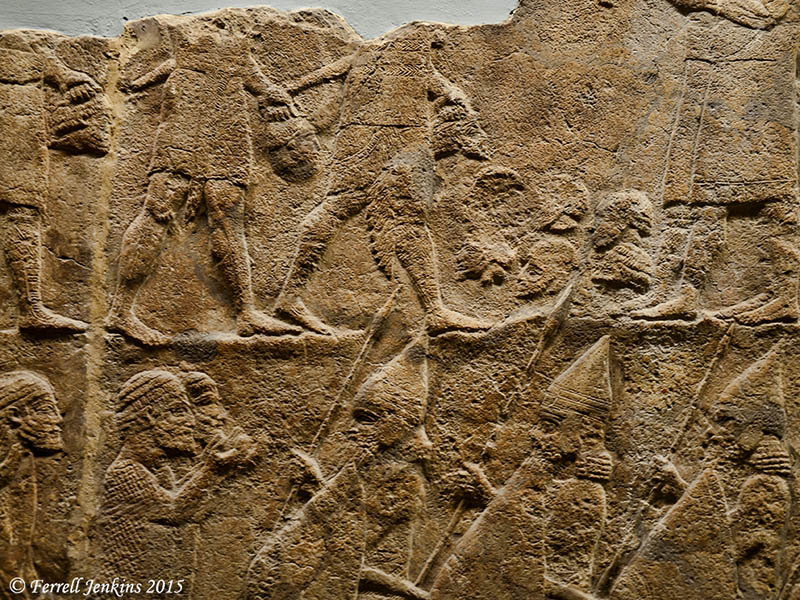 Some scholars suggest that the next panel portrays the Assyrians flaying the Judeans. Bodies of the dead at Lachish. Photo by Ferrell Jenkins. One panel shows local citizens being impaled on poles. After a day of impaling, beheading, or counting heads, it might be easy enough to see “ghosts”. We can desire that all men come to accept the teaching of Jesus when one of His disciples used a sword to advance the cause of the Lord. We finally reached the third of the big three museums with Ancient Near Eastern collections that we had planned to visit. We spent large portions of two days in the museum. The museum is open every day of the week. Closing time is 5:30 p.m. every day except Friday when the time is 8:30 p.m. There is no required entry fee, but a request is made for a £5 (about $8.50) or more donation. I have emphasized the crowds in the Pergamum Museum, and the Louvre. The same was true in the British Museum. The photo below was made a few years ago at the end of September. Once school is in session one should be able to find times without hugh crowds. Many galleries have natural light that comes in. Some photos are better with the natural light and others are better with the artificial light, depending on the glare on the case. British Museum entrance on Great Russell Street, London. Photo by Ferrell Jenkins. 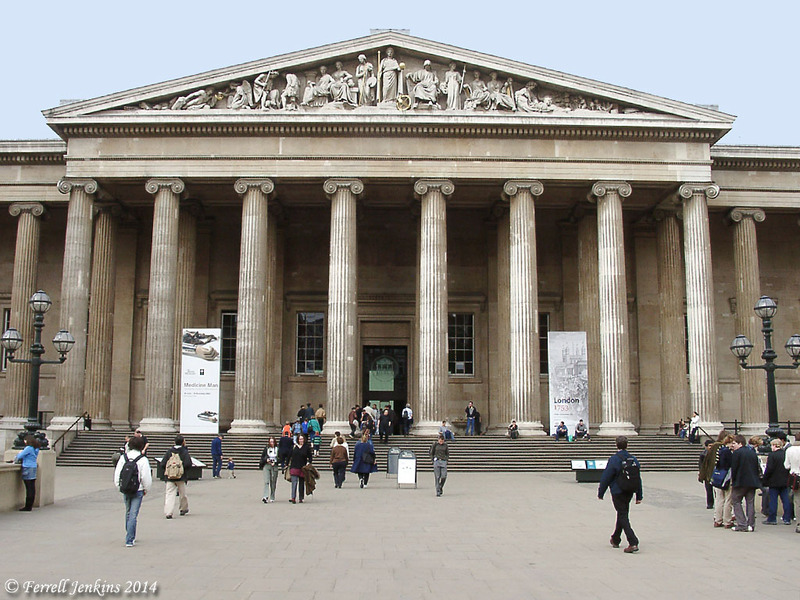 The British Museum was founded in 1753 to house the collection of Sir Hans Sloane which had been left to the nation. It is now among the greatest museums of the world. Each of the big three museums has a specialty depending on the areas where the country has done archaeological work. The Pergamum museum is loaded with material from Mesopotamia and Turkey. The Louvre has a fabulous collection from the Levant, especially Syria, and Iran (Persia). The British Museum is big on the Levant, Egypt and Mesopotamia. All three have nice Roman and Greek galleries. I knew that the Cyrus Cylinder had been part of a traveling exhibit for a few years. When we got near the Ancient Iran Room I told my wife that I would make a quick run to see what was there. I was delighted to see the Cyrus Cylinder prominently displayed. Now in the first year of Cyrus king of Persia, that the word of the LORD by the mouth of Jeremiah might be fulfilled, the LORD stirred up the spirit of Cyrus king of Persia, so that he made a proclamation throughout all his kingdom and also put it in writing: “Thus says Cyrus king of Persia, ‘The LORD, the God of heaven, has given me all the kingdoms of the earth, and he has charged me to build him a house at Jerusalem, which is in Judah. Whoever is among you of all his people, may the LORD his God be with him. Let him go up.’” (2 Chronicles 36:22-23 ESV; cf. Ezra 1:1-4). Some artifacts that I had expected to see were not on display. Cases are changed and artifacts are moved around. Sometimes there will be a sign saying that the items is on loan, being photographed, or studied. In other instances there is no reference to the removed item. One significant item that I missed seeing in its usual place is the Babylonian Chronicle that gives the date of the Babylonian capture of Jerusalem in 597 B.C. Another missing item was the Standard of Ur. A BBC report says that the 80,000 artifacts displayed in the British Museum amount to only 1% of the artifacts held by the Museum. On several occasions I have made inquiry about an artifact and been given a time when someone would be available to show it to me. The British Museum web site provides information about planning a visit, and it also includes an online collection with photos. Shebna, the steward over the household of David, is to be replaced by Eliakim the son of Hilkiah. He will have the key of the house of David with power to open and shut. Consider the use of this text by Jesus in Revelation 3:8. D. J. Wiseman comments on this text and a discovery possibly related to it. Shebna inscription from a tomb in Silwan. British Museum. Photo by Ferrell Jenkins. This tomb inscription was discovered in 1870 by Charles Clermont Ganneau in the village of Silwan. Following the 1967 war David Ussishkin and Gabriel Barkay examined numerous tombs in Silwan. For more information about the inscription, see Lost Treasures of the Bible by Fant and Reddish (154-157). Paul’s voyage to Rome, as it is often called, was actually a trip as a prisoner on a variety of ships from Caesarea Maritima to Puteoli in Italy (Acts 27:1 – 28:13. The trip westward from Myra, on the Mediterranean coast, took the ship near Cnidus (also spelled Knidos) (Acts 27:6-7). Paul would have passed within sight of Cnidus on his return to Jerusalem during his second and third journeys, possibly even stopping at the city (Acts 18:21-22; 21:1). The grain ship upon which Paul was traveling on his captivity voyage to Rome encountered fierce head winds as it tacked westward along the coast of Asia Minor. It is not clear if Paul’s ship was able to make port in Cnidus’ commercial harbor, but the sailing conditions probably prevented it (Acts 27:7). — Biblical Turkey, 192. A British archaeologist excavated at Cnidus in 1957-59. 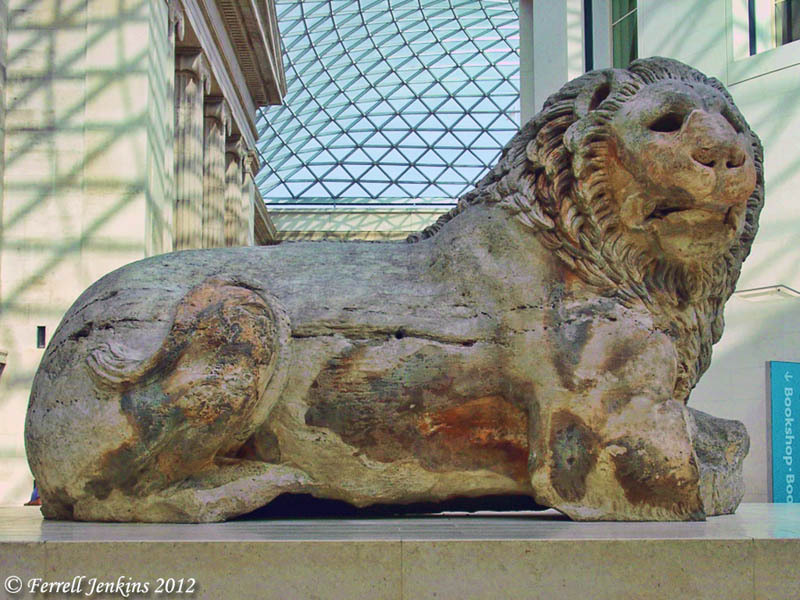 A colossal marble lion that once rested on a monumental tomb was taken to the British Museum where it is displayed in the Queen Elizabeth II Great Court. The lion dates to the late 4th-early 3rd century B.C. Colossal marble lion from Cnidus. British Museum. Photo by Ferrell Jenkins. This lion crowned a monumental tomb at the edge of a cliff overlooking the sea. The hollow eyes were probably inset with glass to catch the light. Did Paul see this lion? More than likely, I think, during the return from the second and third journeys. 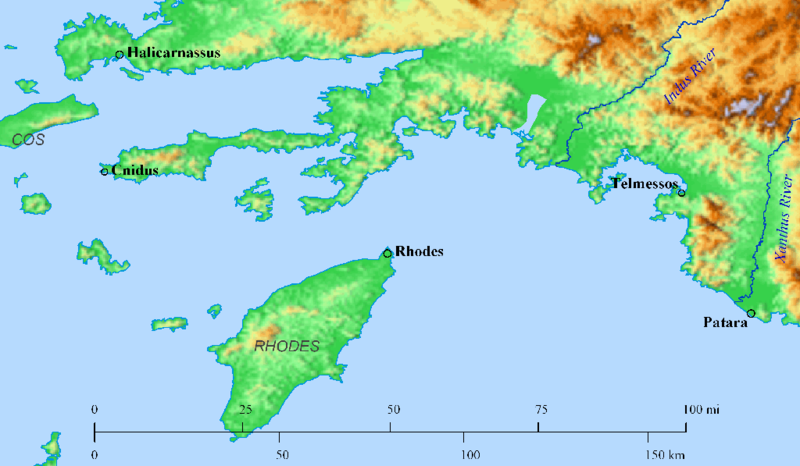 The map below shows the location of Cos, Cnidus, Rhodes and Patara. Click the image for a higher resolution. Map showing Cnidus, Rhodes, and Patara. Made with Bible Mapper 4.